It has happened. I can no longer officially wear my regular pants. My baby belly has begun! After I finish some custom orders, I am going to work on sewing some new maternity clothes (which are desperately needed). You are so beautiful! And I am so excited for you!! you are truly Glowing! Beautiful Photos. I loved being pregnant. It is such a miracle and so amazing! Great idea. I wish I had taken more pregnancy pictures. I think I have maybe 2 or 3 pictures of myself when I was pregnant. I saw that picture in your header a few days ago and thought it was super cute! Love the rest too! And you are gorgeous as always! You look stunning! I hope you’re feeling better now. I’m 14 weeks along and I’m starting to feel like eating something other than cheese sandwiches, haha. If you have any tips on sewing maternity clothes or even adapting regular patterns for maternity proportions, I would love posts on that. I’m looking to sew some myself, but I’m not sure how to adjust the patterns. Thanks for sharing your journey with us! Oh, please post about sewing maternity clothes! I’m 14 weeks along and really would like to make some for myself, but I’m not sure how to get the proportions right. You look beautiful, by the way! Thanks for sharing your journey with us. yeah! how fun! we’re on #3 and the belly was here at like 8 weeks…I’m sure the pants fitting have something to do with them pushing on a belly that’s got morning sickness?? You have such a cute little baby bump!! Beautiful photos of you Jessica! If you like skirts, I have the great pattern for a really great knit maternity skirt. Remind me and I’ll send over the pattern info for it. Aww…you are so adorable!!! Congrats!! 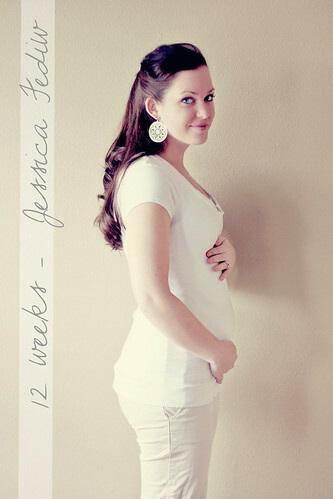 I can’t wait to see what you make for maternity clothing!!! Glad you posted these! I am currently 12 weeks pregnant (I suspect you’re 13 or so, because your header has been changed for a while) and just yesterday I showed my husband your photo and said, “Can you take a picture of me like that!” Haha. Mine didn’t come out as nice, but we’re not very good photographers! Pregnancy definitely agrees with you, you look great! i love your new banner, just gorgeous! You are looking fabulous, hope you’re feeling well! Just a little tip you might like – I used a hair elastic threaded through the hole in my pants, with the button poked throught it like a regular button hole for all of my first pregnancy, and about 2/3 of my second pregnancy. It made my regular pants go the distance, and saved me a bunch on maternity clothing. (I only needed tops for most of the first pregnancy and I wore dresses and such at the end of both pregnancies as it was Spring). Such pretty pictures! Congrats on the baby on the way! Congratulations — such an exciting time!! So congratulations! I’m so happy for you. tips on making maternity clothes or a tutorial would be amazing. I don’t think i’ve ever seen on one the sewing blogs i follow and I could definitely use one with twins on the way! Congrats! Our friends are on No. #7 but the same ‘pregnancy glow’ is still there. You look so content and happy in those pictures. Please share the maternity clothes ideas that you have. I am just a few weeks behind you and would love the help!!! You are so sweet!! !Beautiful photos! You look so gorgeous Jessica! I would love to see the clothes you make. 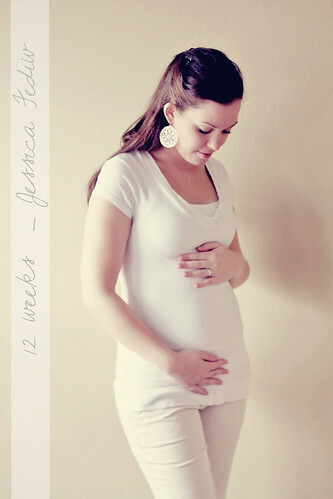 I am 11 weeks pregnant with my 4th & I will be pregnant through the summer for the first time. So I am desperately in need of maternity clothes! !